Drugs can often cause hyper pigmentation such as antiarrhythmics (amiodarone), antimalarials, antibiotics (minocycline), antivirals (zidovudine), chemotherapy agents, heavy metals, hormones and antipsychotics (chlorpromazine). Each drug or condition causes the skin to discolor in various places. For example, Antimalarial agents typically cause a brown discoloration on the shins, whereas Melasma typically presents on the cheeks and central face. In addition, Melasma is often associated with oral contraceptives use. Melasma (Chloasma, Mask of Pregnancy) is often a common complaint in women with darker skin tones. The forehead, malar cheek, upper lip, and chin are the most affected areas. It’s often more prevalent after sun exposure and often occurs after the second or third trimester of pregnancy and in some women after taking oral contraceptives. We suggest clients minimize their sun exposure at mid-day and encourage wearing hats and sunscreen with SPF 30+. It’s important to use sunscreen that protects you from ultraviolet A and ultraviolet B. To learn more about effective and safe treatment of Melasma contact us today for a FREE consultation! 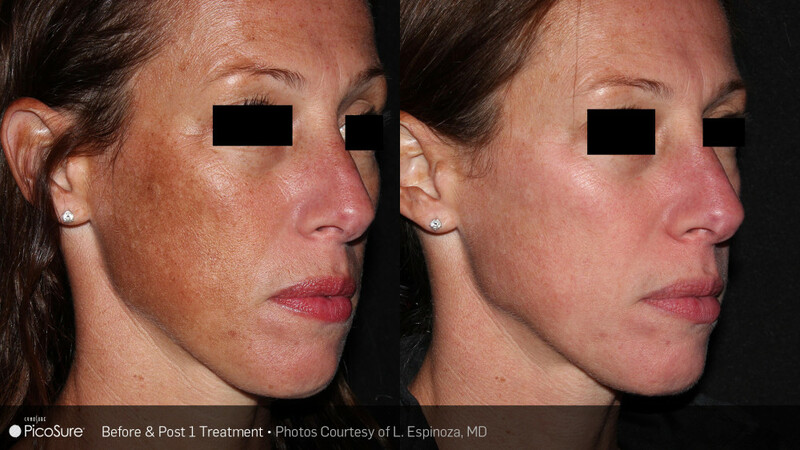 Maine Laser Clinic provides effective and gentle treatment for Melasma. Our skilled practitioners use laser energy with a unique 0.65msec pulse duration that heats the melasma quickly for higher clearance. Laser technology penetrates much deeper into the dermis as compared with Q-switched Nd:YAG lasers, affecting deeper layers of melanin and providing better clearance. Melasma is a significant cosmetic concern for many patients. Common factors that contribute to it include genetic predisposition, hormones, sun exposure and inflammation of the skin tissue. Melasma is commonly treated with prescription creams containing bleaching agents, particularly hydroquinone; treatment efficacy can vary, and a variety of side effects are linked to hydroquinone including allergic reactions and skin irritations such as redness, blistering, dryness and itching. Maine Laser Clinic employs a powerful tool enabling treatment of melasma while simultaneously disrupting excessive melanin formations in both the epidermis and the deep dermal tissue.